If we want to make websites, there is no way around HTML. Even if we are using a program to create websites, such as Dream weaver, a basic knowledge of HTML can make life a lot simpler and our website a lot better. The good news is that HTML is easy to learn and use. HTML is used to make websites. Hyper is the opposite of linear. In the good old days – when a mouse was something the cat chased – computer programs ran linearly: when the program had executed one action it went to the next line and after that, the next line and so on. But HTML is different – you can go wherever you want and whenever you want. For example, it is not necessary to visit MSN.com before you visit HTML.net. Implementation means converting a system design into operational form. This phase is divided into 2 parts – database implementation and user interface implementation (code generation). In the first part, the logical database design was implemented as the physical database design. All the data types were defined properly on each table. The relations among the tables were described by using primary key and foreign key concepts. 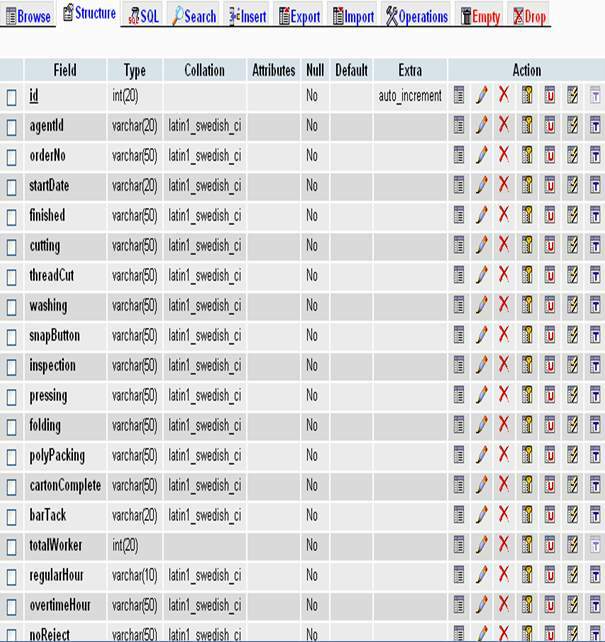 The second part was to generate code to insert business data to the database through user interface. This part includes the followings, to create user interfaces to insert, update and search and delete data and to generate different reports for the managements from those data. Data is the collection of facts which the most important factor in any organization. Data plays the most important role in business activities and day to day events. The table name is agent_info. It contains agent’s information. It has ten data fields. id contains a unique number for every agent. loginId and pass are used for accessing the system. The table name is buyer_info. It contains buyer’s information. It has nine data fields. id contains a unique identification for distinct buyers. loginId and pass are used for accessing the system. The table name is orderinfo. It contains order’s information. It has seven data fields. orderNo contains a unique identification for every order. The table name is productioninfo. It contains product’s information. It has nineteen data fields. id contains a unique identification for every product. This table is used by admin/agent. Here agentId and orderNo are foreign keys. The table name is order_status. It contains order status information. It has six data fields. id contains a unique identification for every order status. The table name is wash_info. It contains washing information. It has thirteen data fields. The table name is product_detail. It contains product’s detail information. It has eight data fields. iid contains a unique identification for every product. The table name is transactioninfo. It contains transaction’s information. It has five data fields. id contains a unique identification for every transaction. 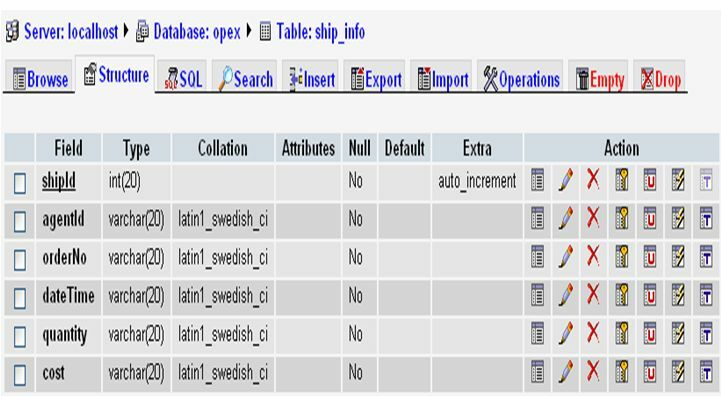 The table name is ship_info. It contains shipment’s information. It has six data fields. shipid contains a unique identification for every shipment. 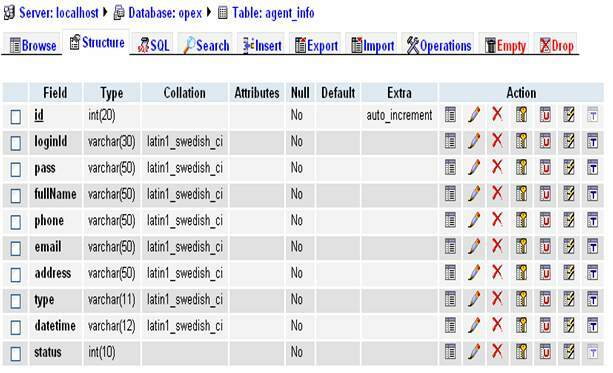 This table is used by admin/agent. Here agentId and orderNo are foreign keys. Other attributes are dateTime, quantity and cost. Home page used for showing the new and existing product picture and price. A user uses this web page for login. By clicking on the picture of the product we can see the detailed information like buyer information, fabric details, style details. 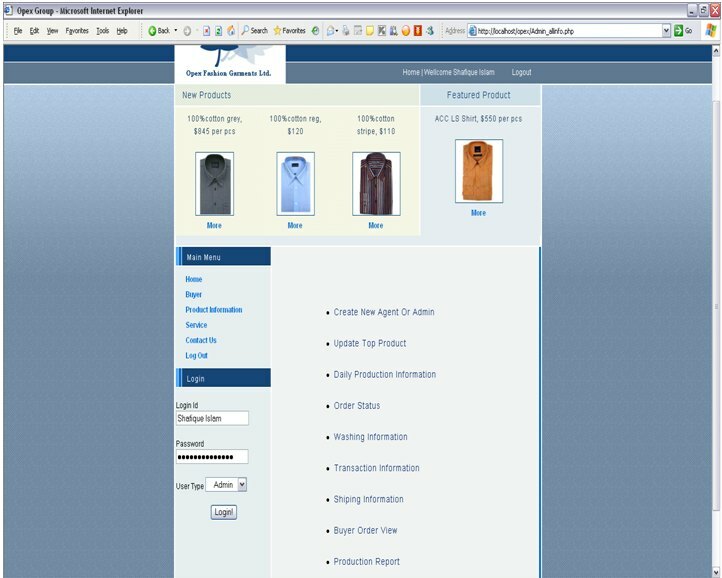 The left side contains the main menu where homepage, buyer, product information, service, contact us and logout. 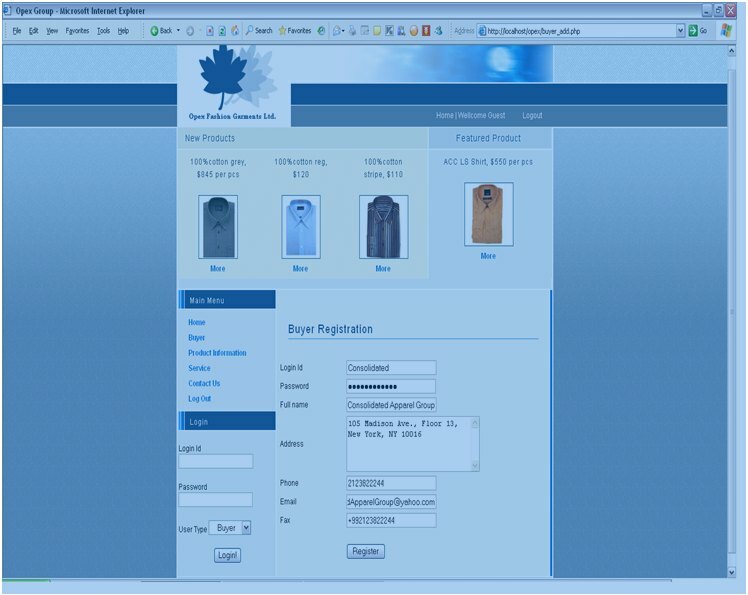 Buyer uses this page for his or her registration. 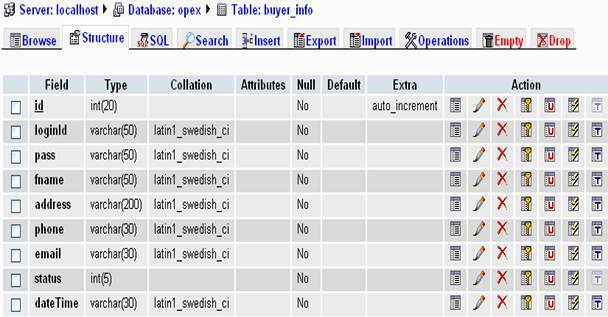 Buyer information’s stored into the database table by this web page. Here information about Login id, Password, Full name, Address, Phone No., Email, Fax are entered. To confirm the registration, Register button is used. Without registration, buyer can not access this system. 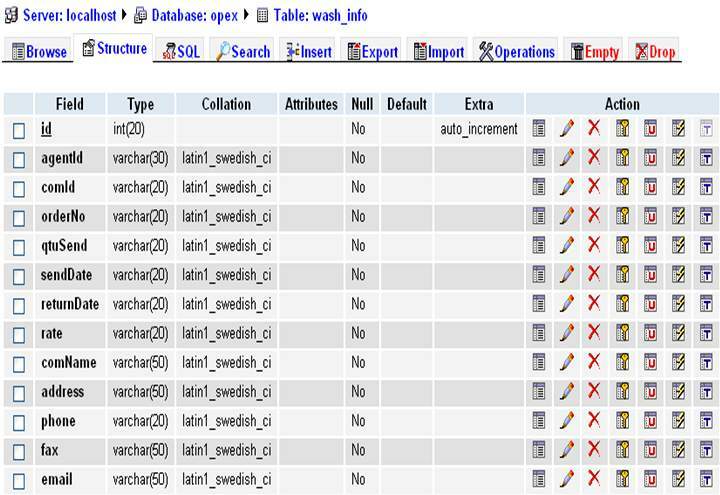 Administrator can use this page to view all production information and production report. Here information about Create New Agent or Admin, Update Top Product, Daily Production Information, Order Status, Washing Information, Transaction Information, Shipping Information, Buyer Order View, Production are linked with different pages. Admin can register new agent or admin. 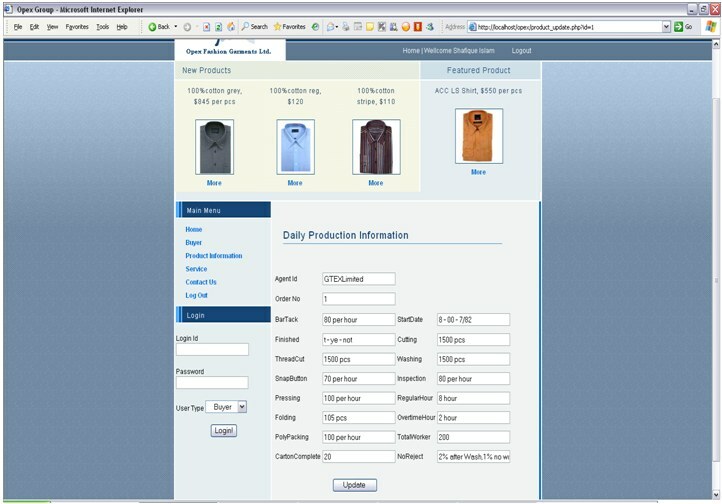 Daily product information’s are stored into the database table using this web page. Here information about Agent Name, Order No, Finished, ThreadCut, SnapButton, Pressing, Folding, PolyPacking, CartonComplete, StartDate, Cutting, Washing, Inspection, RegularHour, OvertimeHour, TotalWorker, NoReject are entered. Here we discuss those tools (HTML, PHP, MySQL, Macromedia Dreamwaiver, CSS and Apache Server) which are used for implementing this system. 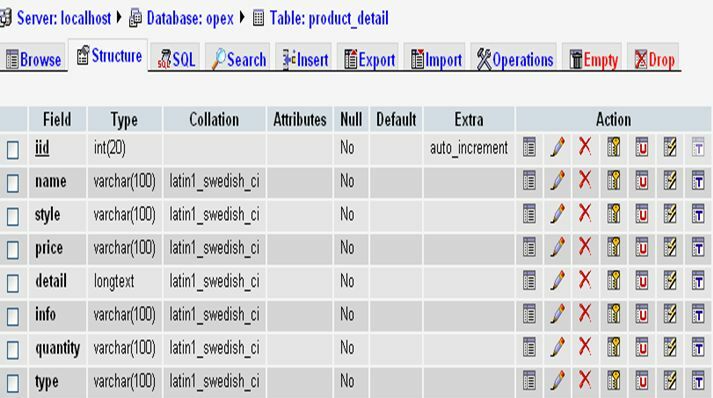 We also discuss the database table and some web pages which are need for implementing this system. Software testing is a critical element of software quality assurance and popular risk management strategy. Here, programmer compares the actual result with required result. Testing is the process to review of the specification, design and coding. In fact, testing is the one-step in the software engineering process that could be viewed as destructive rather than constructive . A good test case is one that has a high probability of finding as-yet undiscovered. All test should be traceable, that is the objectives of testing should be uncovered basis on customer requirements. Test should be planned before testing begins. An independent third party should conduct test. The purpose of test planning is to provide the basis for accomplishing testing in an organized manner. If a test plan is comprehensive and carefully thought out, test execution and analysis should proceed smoothly . Has a good chance of detecting a majority of the defects. Is executed easily, repeatable and automatically. Defines the types of test objectives. Clearly defines the test objectives. In computer programming, unit testing is a procedure used to validate that individual unit of source code is working properly. Unit testing is a software development process in which the smallest testable parts of an application, called units, are individually and independently scrutinized for proper operation. Unit testing is often automated but it can also be done manually. This testing mode is a component of Extreme Programming (XP), a pragmatic method of software development that takes a meticulous approach to building a product by means of continual testing and revision . Integration testing, also known as integration and testing (I&T), is a software development process which program units are combined and tested as groups in multiple ways. Integration testing can expose problems with the interfaces among program components before trouble occurs in real-world program execution. Integration testing is a component of Extreme Programming (XP), a pragmatic method of software development that takes a meticulous approach to building a product by means of continual testing and revision . There are two major ways of carrying out an integration test, called the bottom-up method and the top-down method. Bottom-up integration testing begins with unit testing, followed by tests of progressively higher-level combinations of units called modules or builds. In top-down integration testing, the highest-level modules are tested first and progressively lower-level modules are tested after that. In a comprehensive software development environment, bottom-up testing is usually done first, followed by top-down testing . In other words, validation ensures that the product actually meets the user’s needs, and that the specifications were correct in the first place, while verification is ensuring that the product has been built according to the requirements and design specifications. Validation ensures that ‘you built the right thing’ . The process of evaluating software to determine whether the products of a given development phase satisfy the conditions imposed at the start of that phase. Verification ensures that ‘you built it right’ . Software testing may be viewed as an important part of the Software Quality Assurance (SQA) process. In SQA, software process specialists and auditors take a broader view on software and its development. They examine and change the software engineering process itself to reduce the amount of faults that end up in defect rate. What constitutes an acceptable defect rate depends on the nature of the software. An arcade video game designed to simulate flying an airplane would presumably have a much higher tolerance for defects than software used to control an actual airliner. Although there are close links with SQA testing departments often exist independently, and there may be no SQA areas in some companies . Software testing is the process used to measure the quality of developed computer software. A human being can make an error (mistake), which produces a defect (fault, bug) in the code, in software or a system, or in a document. For that region, testing is an important. Different types of testing are used in this project. Every system has some limitations or problems. Our systems also have some problems. In this chapter, we discuss those problems. Problems are everywhere. 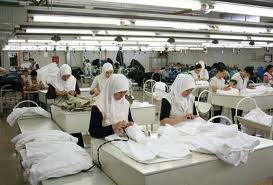 Normally garments industries are always busy with their work. So our data collection were delayed sometimes due to the business of the garments personnel. We also have faced problems during the installation of XAMPP. Port no. 80 & 434 should not be busy during the activation of apache server. Also IIS sometimes conflicted with apache. We found few troubles of designing this project because we are the new developers in the software field. We have also faced some problems during data analysis, database design, data normalization and in the time of making relationships among several tables. IIS is not supported because of some function of PHP do not properly work in IIS server, we must use Apache server for our software. If buyer is illegal it’s can’t be verified, that is mail checking system is not used. To final an order for production there is needed buyer’s representative. This system only maintains the production side. Report can not be generated properly if the time format is not matched between database & PHP coding. After completion our project, we get some problems. We faced some problems in installing the software, we used in implementation of the system. In the future, we will try to solve those problems. There is no doubt that Online Application is most popular and important for all. Now a day, we depend on the Online for everything like job searching, advertising, buying goods etc. Our proposed system is also online based. In the proposed system maintained full production sector. The combination of HTML, CSS and PHP are used for front end design and MySQL is used for back end. Apache server is used as a server. 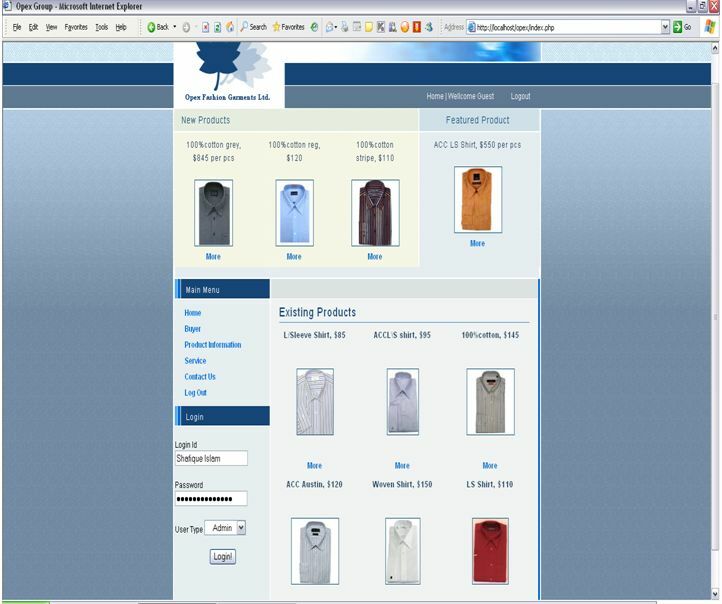 We think one day this “Online Garments Product Management System” will be a complete solution for the administrators. At first we collect the relevant data from the Opex Group, then we planed, designed architecture, made papers, observed the system and prepared database. Finally, we started the implementation phase and complete the project. Mainly three kinds of user can access this software. Every user has to be registered first of all. Admin can access the whole system and can generate the production report, which shows the complete and running production information. All of the users are benefited by the system. The administrator will get the maximum benefit from it. He can take any decision easily and quickly. Better control and security ensures data, reduce manpower, eliminate paper work and increase the efficiency of the daily work. There are further more areas where the application can be developed to support the Opex Group. For example HR system and Accounts system can be developed and integrated with this application to get the better outcome. Different reports can be designed to retrieve data from the database as per the requirements. The requirements of the management changes over the time. So the application also need to upgrade every after certain time. The server side validation was not performed in this application which is mandatory in good programming practice.